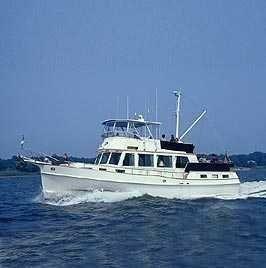 WAVE WALKER is a remarkable Grand Banks 49 in both her condition and equipment. 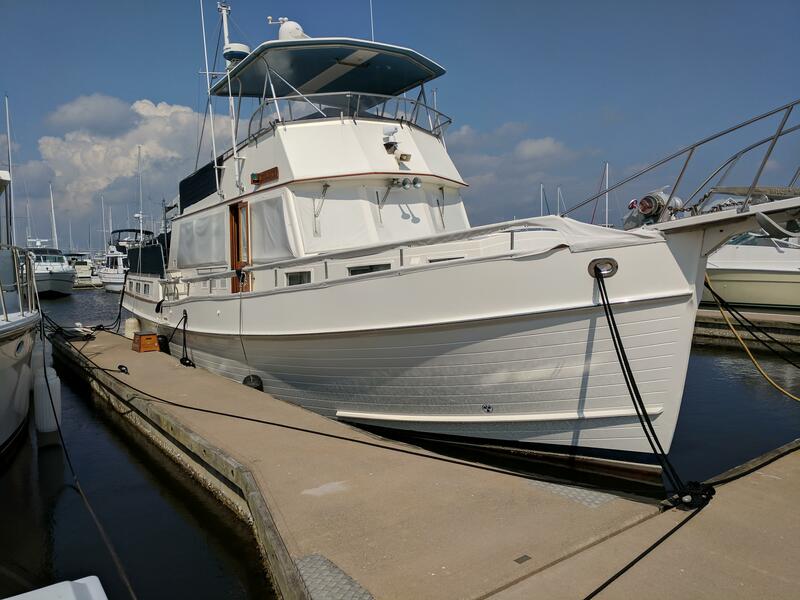 She has been professionally maintained and cruised sparingly on the East Coast. 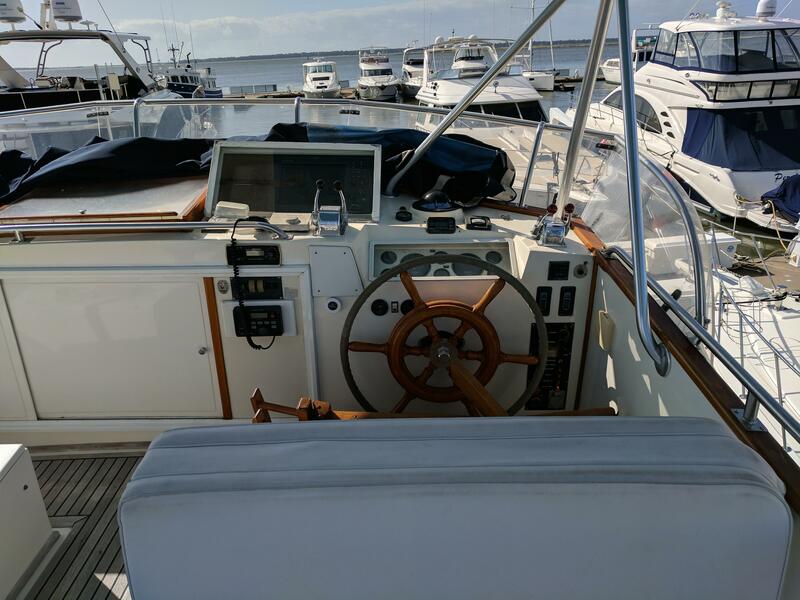 For much of her life she was stored out of the water in the winter - under cover - and as a result, her teak decks and exterior surfaces are in better condition than one would expect for a vessel of her age. 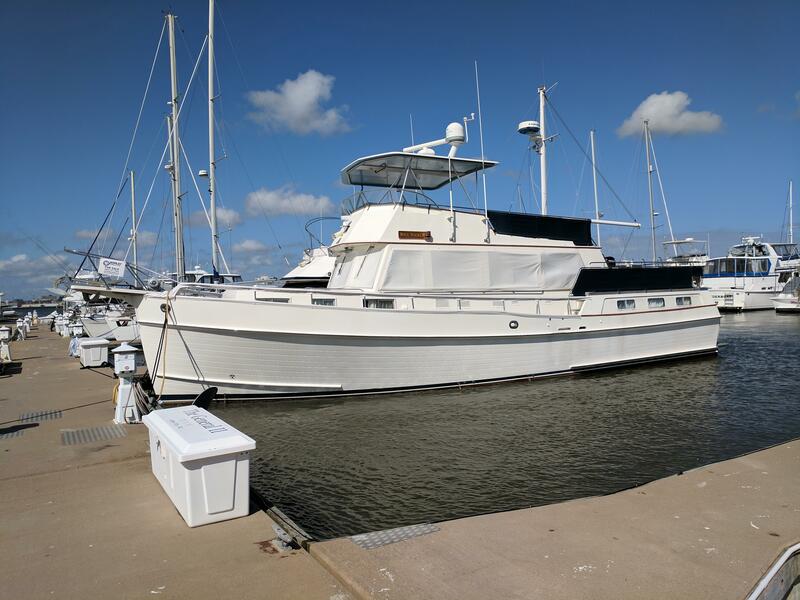 Her current owners have not been able to use her as much as they intended and are reluctantly putting her on the market for someone who can appreciate an outstanding vessel that is ready to go. 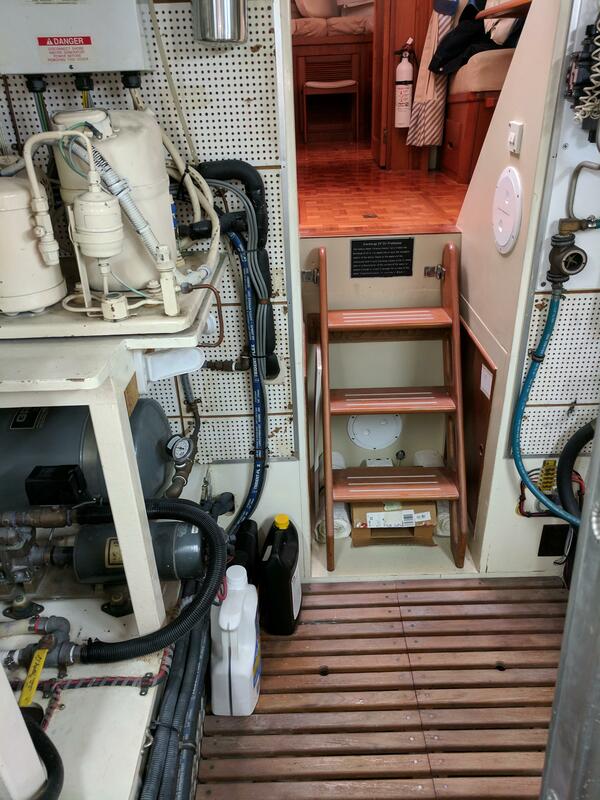 Spacious accommodations in a two stateroom galley down layout. 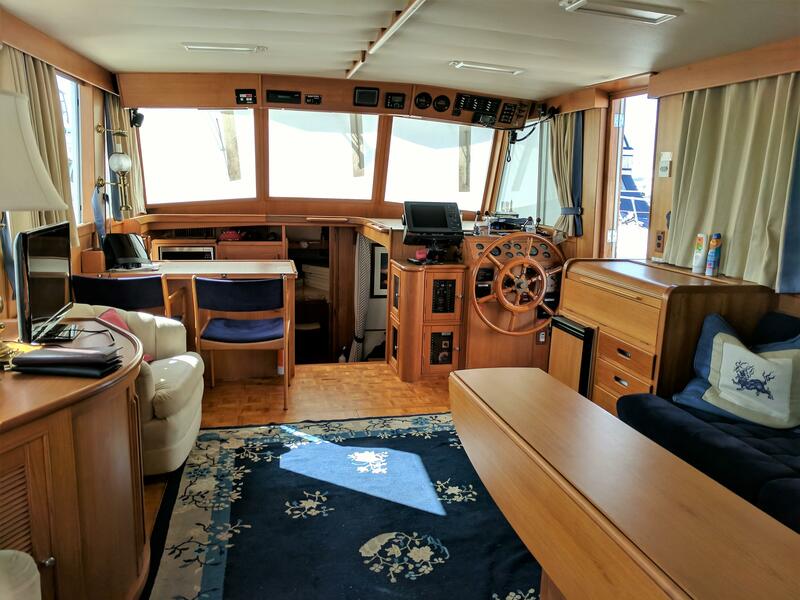 Full teak interior with traditional teak parquet soles throughout. 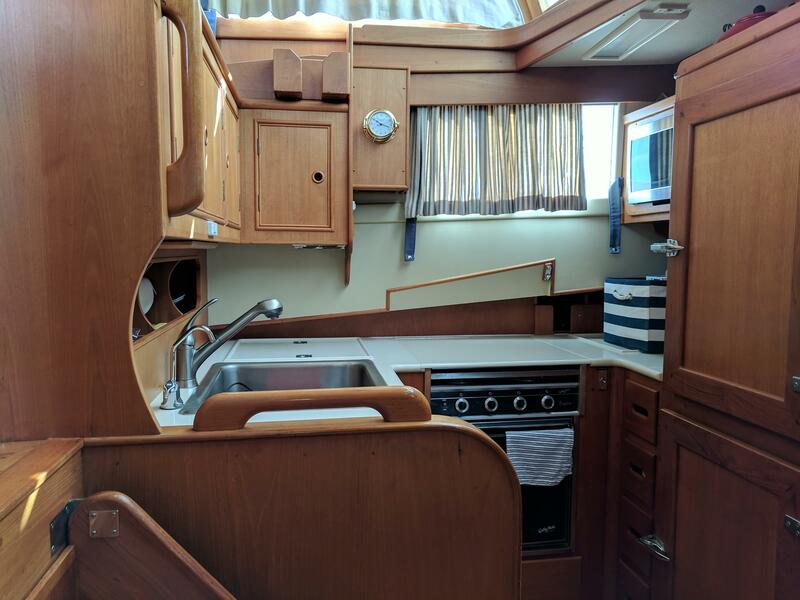 Natural light and ventilation are rather abundant with four shaded and screened hatches, five screened ports in the master stateroom, four large sliding screened windows in the saloon, and six screened sliding ports in the forward trunk cabin. Reading lamps are polished brass and are located at each berth and settee. 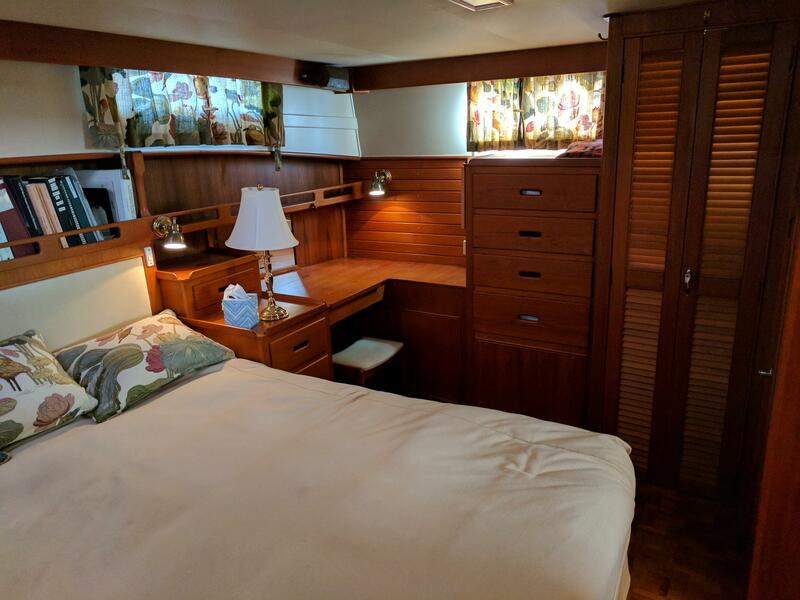 Starting forward is the Guest Stateroom with large V-berth, teak hull ceiling, and deep shelves over. Underneath there is stowage in six drawers and a small locker under the step for comfortable access to the berths. 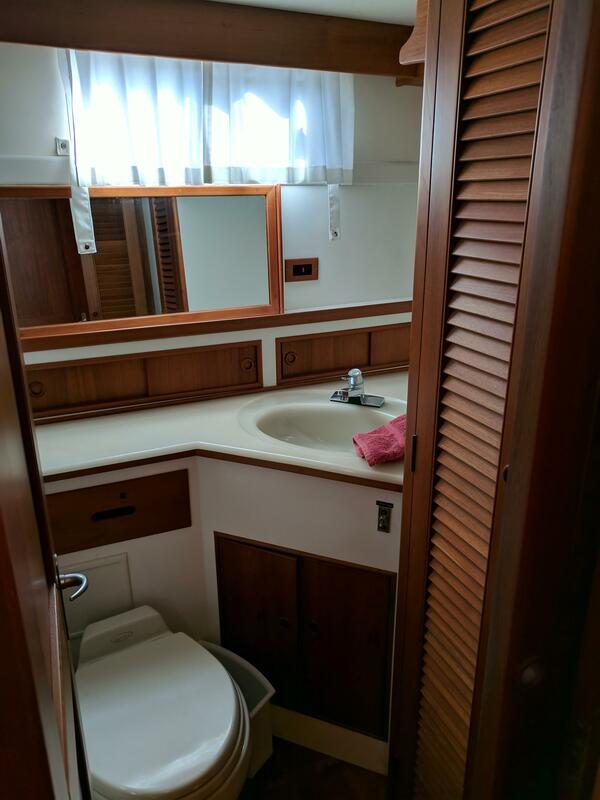 Additionally, there is access to the divided chain locker in the forward bulkhead and a substantial hanging locker aft of the port V. The Guest Head adjoins the forward stateroom and features a cultured marble vanity top and sink with hot and cold pressure water, good stowage in two lockers and one drawer, and Vacuflush head. Opposite to port is the separate stall shower. Next aft to port is the Galley while opposite to starboard is the dinette. 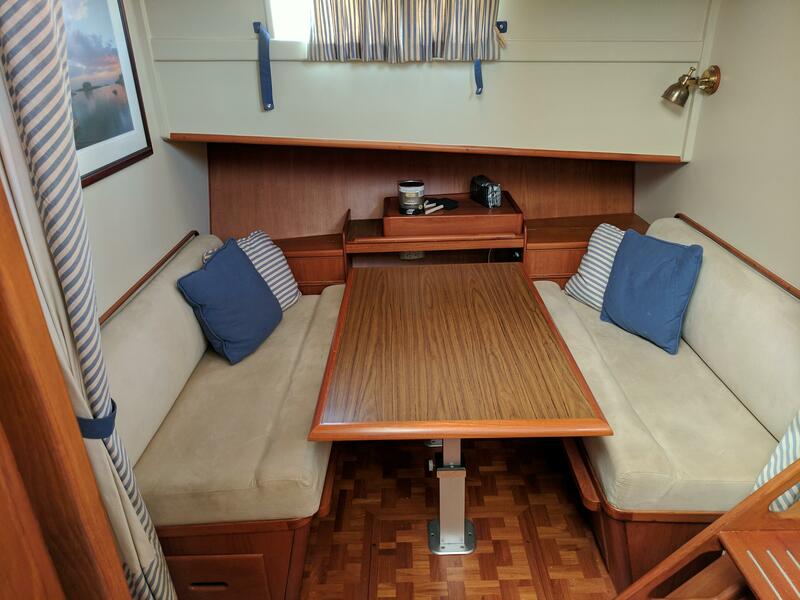 This space is set up with opposing bench seats facing fore and aft with drop front locker doors outboard and drawers on the inboard ends. 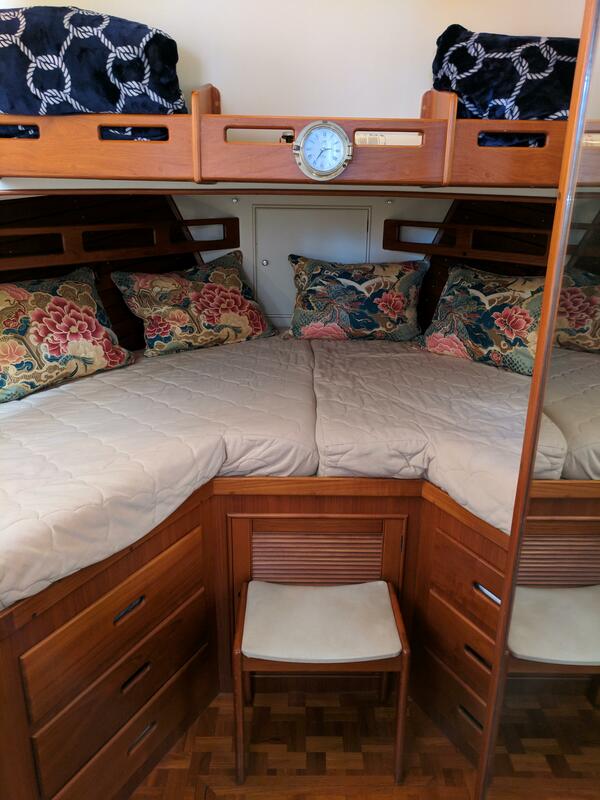 The table makes down into an oversized double berth. Teak joiner work along the hull side incorporates additional stowage units and a shelf with fiddle. Above the cabinetry the hull is sheathed with teak ceiling. The entire dinette can be isolated from the rest of the yacht with an attractive privacy curtain. The dinette area is useful beyond meals or occasions when it is used for sleeping additional guests. Adjoining the galley it provides generous extra counter space when preparing food for larger parties. 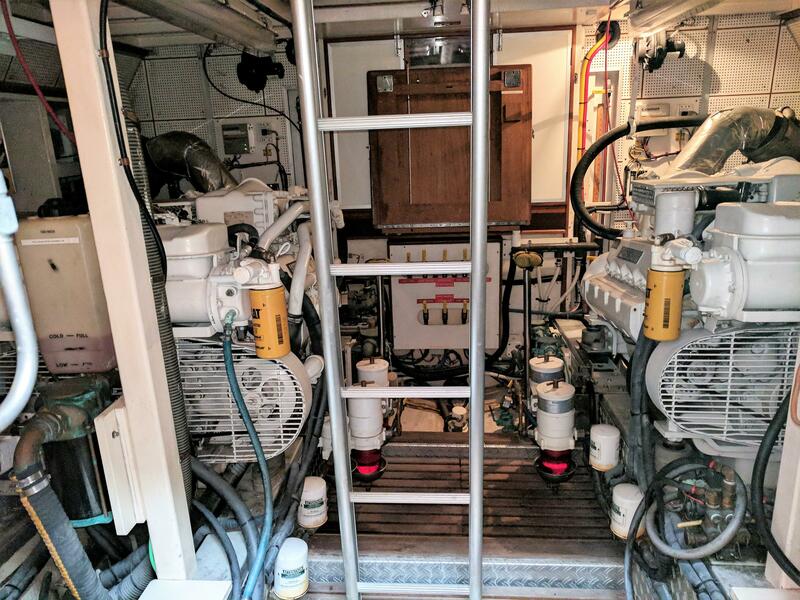 Up 4 steps is the Main Saloon (these steps are hinged and swing up to provide walk-in access to the engine room). 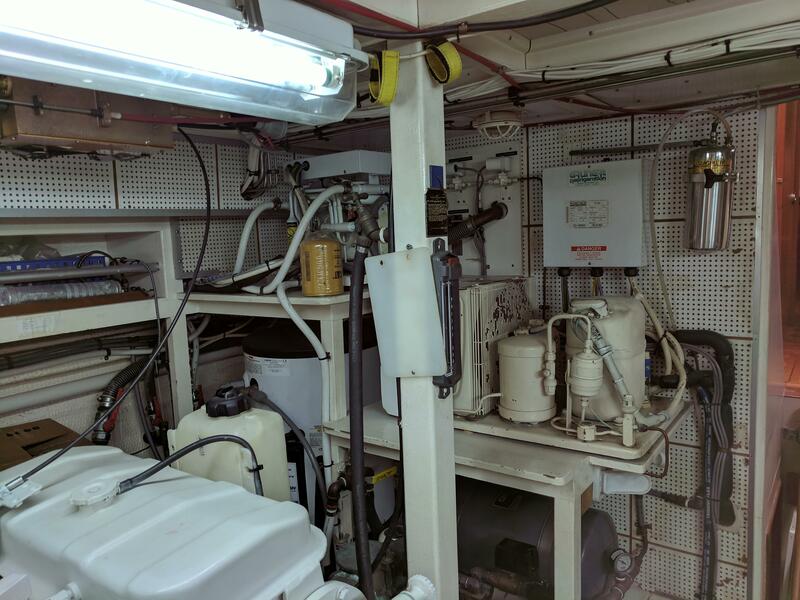 The salon area is unusually spacious due to the galley down arrangement. 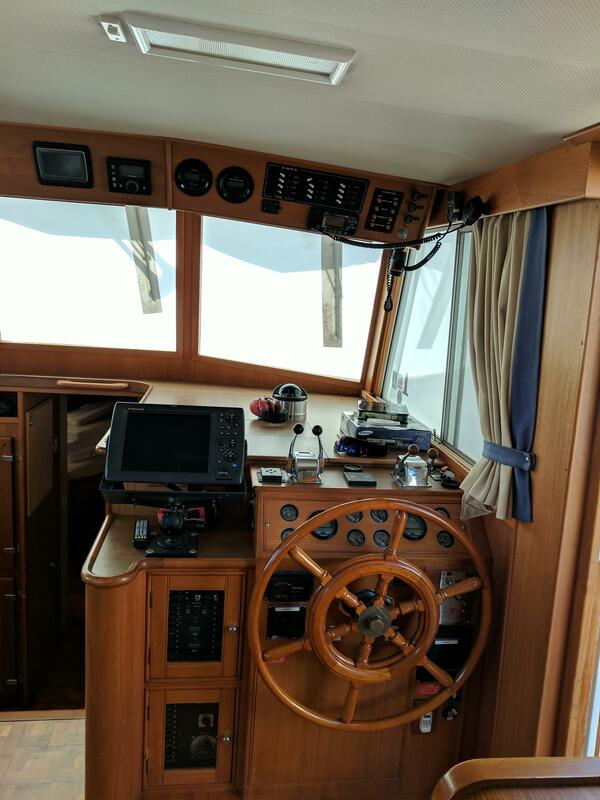 To starboard is the lower helm station while opposite to port is the breakfast bar. This bar was custom built to take a full sized unfolded chart when used for navigation by use of the flip up extension. Two chairs fit comfortably in the space. 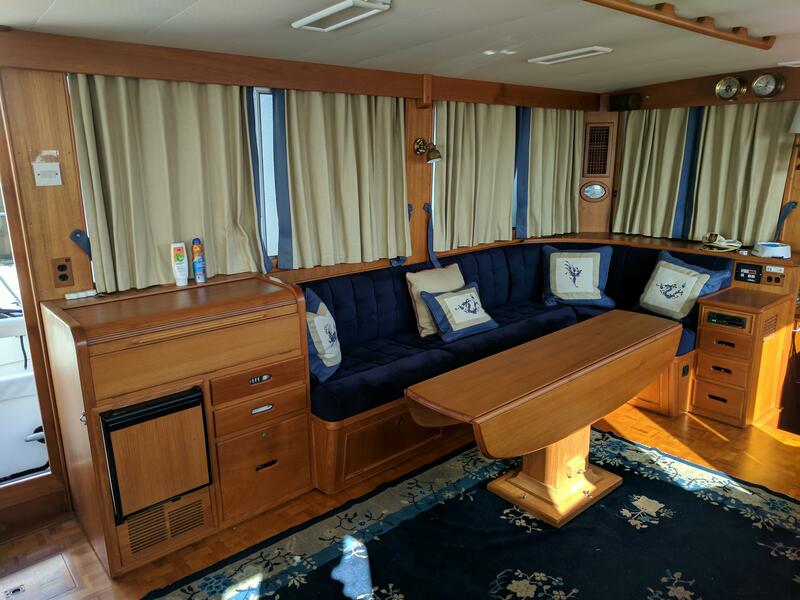 Along the port side, a bow front entertainment center with tambour doors and additional stowage either side is framed by two barrel chairs. Further aft is a set of stairs that provide convenient egress to the aft deck. There is additional stowage under 2 of the stairs. 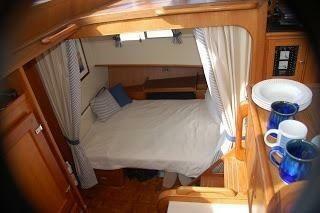 Opposite to starboard is the generous L-settee which has stowage below accessed via drop front locker doors. A hi/lo drop leaf table adjoins. 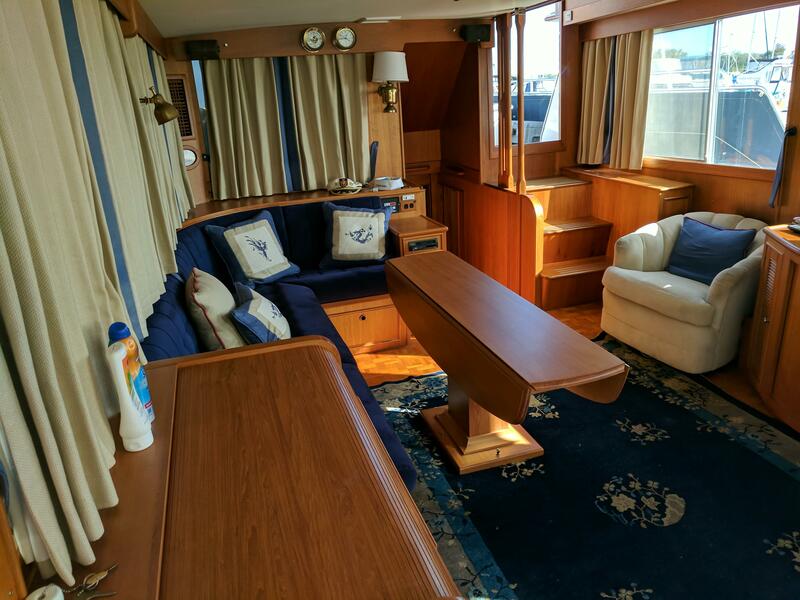 At the aft inboard end of the settee is a small bureau which houses the stereo and has additional stowage in 3 drawers while forward of the L-settee is a large wet bar and starboard door. 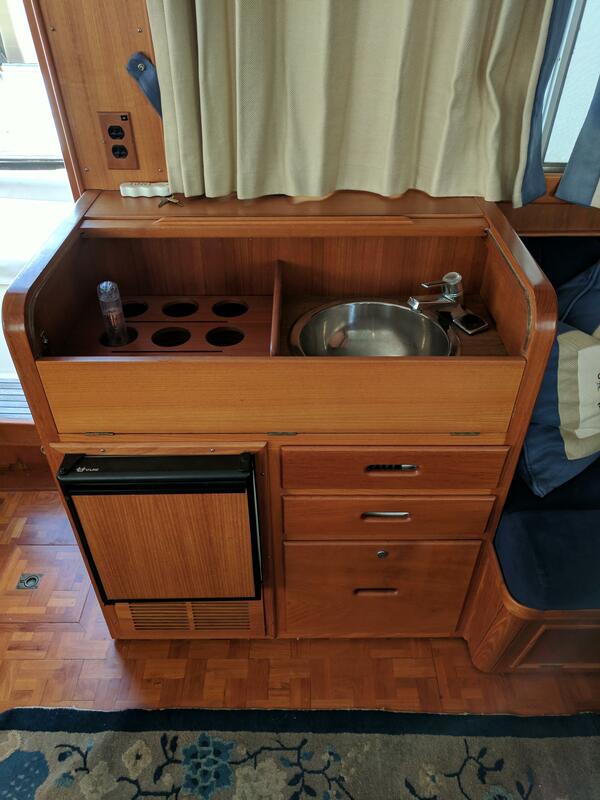 The roll top wet bar houses a stainless steel sink, U-line icemaker, liquor drawer and one additional stowage drawer. The environment is enhanced by indirect valance lighting in the main salon. Down 4 steps is the Master Stateroom, two heads and laundry. 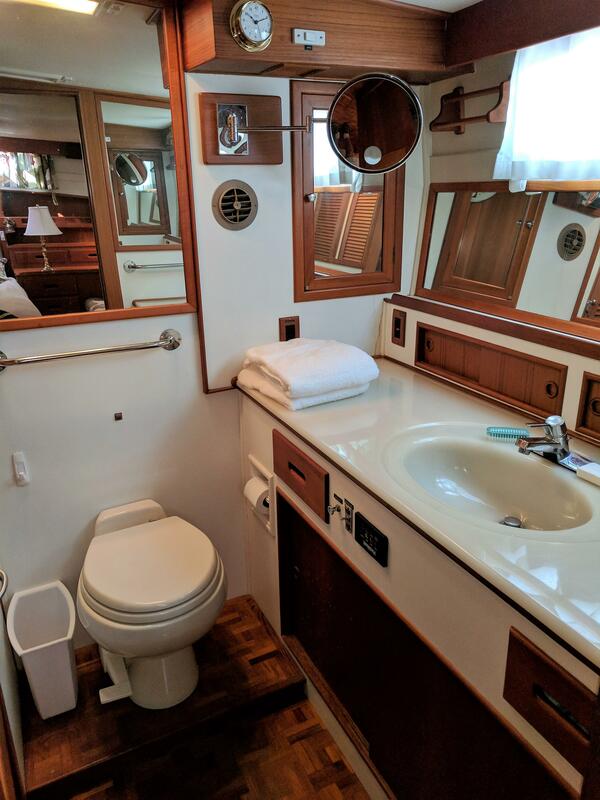 Proceeding aft along a short companionway, to port is the ''day head'' featuring Vacuflush head, cultured marble vanity top and sink, hot and cold pressured water and good stowage in 3 lockers and 1 drawer. 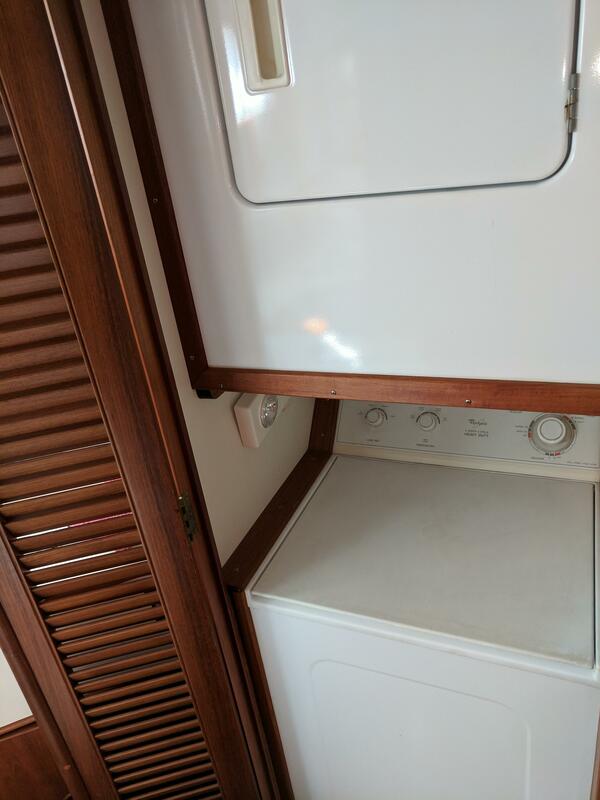 The laundry area is located in this space and features a separate Whirlpool washer and dryer housed in a closet with louvered teak door. Further aft is the stateroom and ensuite full head to starboard. The 2nd head is larger and includes an ample linen closet, stall shower, cultured marble vanity top and sink, Vacuflush head, and generous stowage in 6 lockers and 1 drawer. 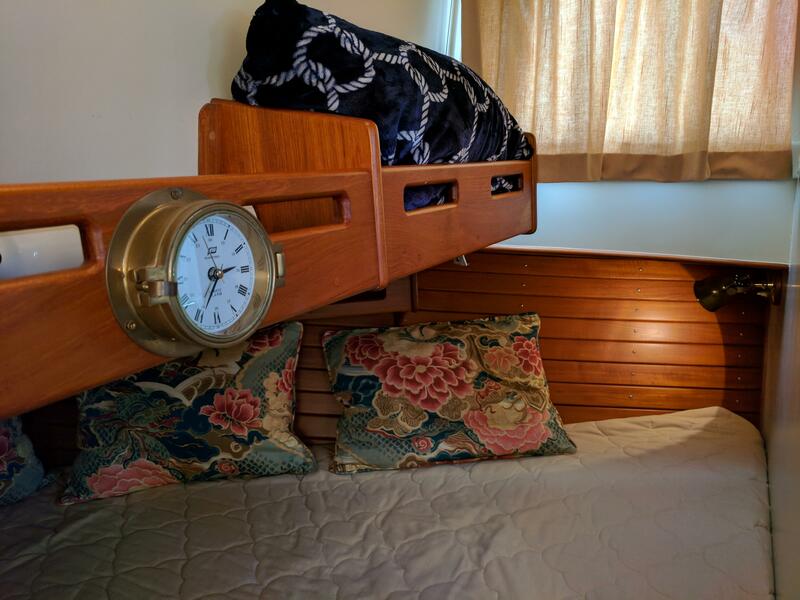 The Master Stateroom is generous and plush with an impressive amount of stowage. 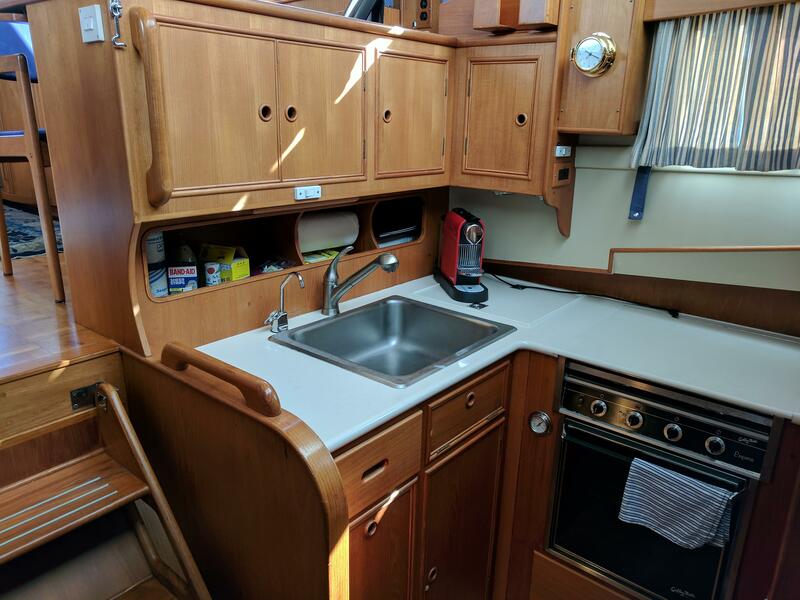 On centerline is the Island Queen with 5 large storage drawers underneath as well as a large chart drawer capable of taking full sized unfolded charts. The head board removes for access to the emergency tiller storage and some additional space for spare lines. To port is a 3/4 height hanging locker with TV cabinet with turnstyle and tambour door over. Next is a full height hanging locker followed by a large bureau with 4 drawers and then a comfortable sized writing desk/vanity with stool. 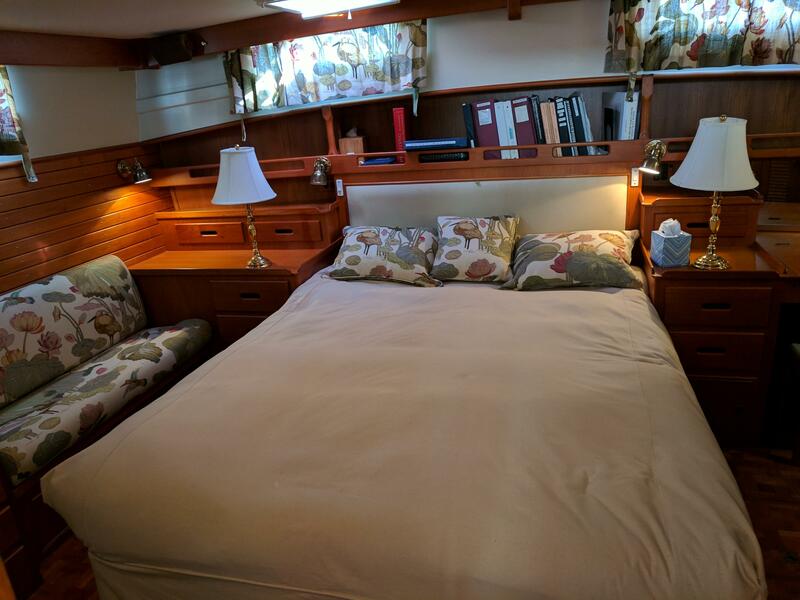 Adjacent to the berth, port and starboard, are night stands with 3 drawers and a locker (starboard side unit is larger and has a fourth drawer. Forward of the starboard night stand is a double settee with stowage below accessed via drop front lockers. Next forward is a small bureau with 4 drawers and then a larger bureau also with 4 drawers. 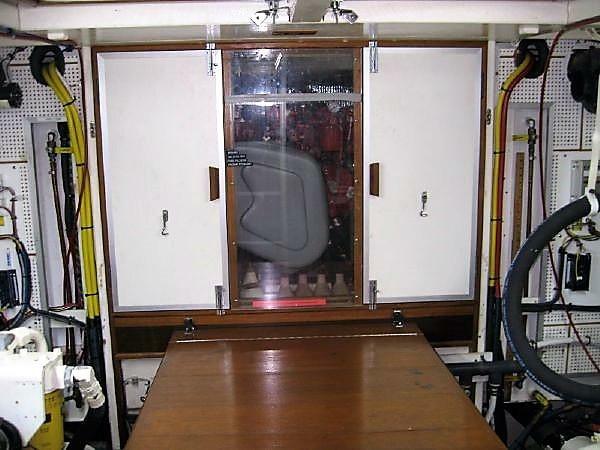 A deep bookshelf runs the width of the aft cabin above the berth. U-shaped Galley down arrangement with good counter space (Corian). Excellent storage in 5 lockers and 1 set of drawers. 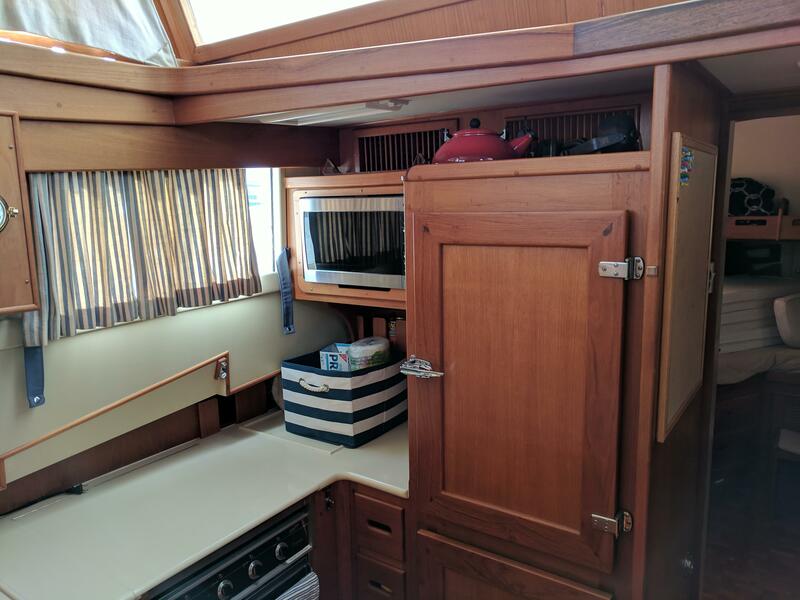 There are over/under front, loading teak paneled, refrigerator boxes and a top loading freezer box. All have external thermometers. Large single basin sink with hot and cold pressure water. Wired for both 12VDC service and 110VAC service. 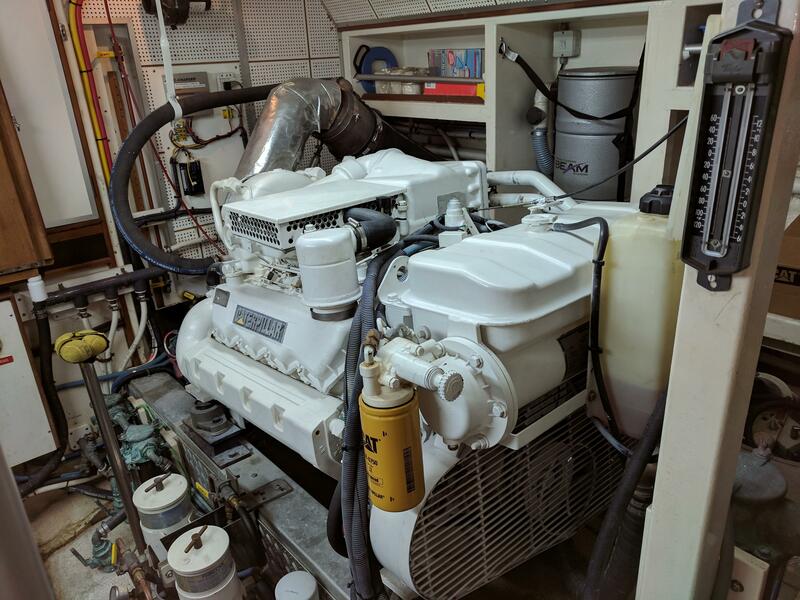 Westerbeke 20KW genset with just 1675 hours. 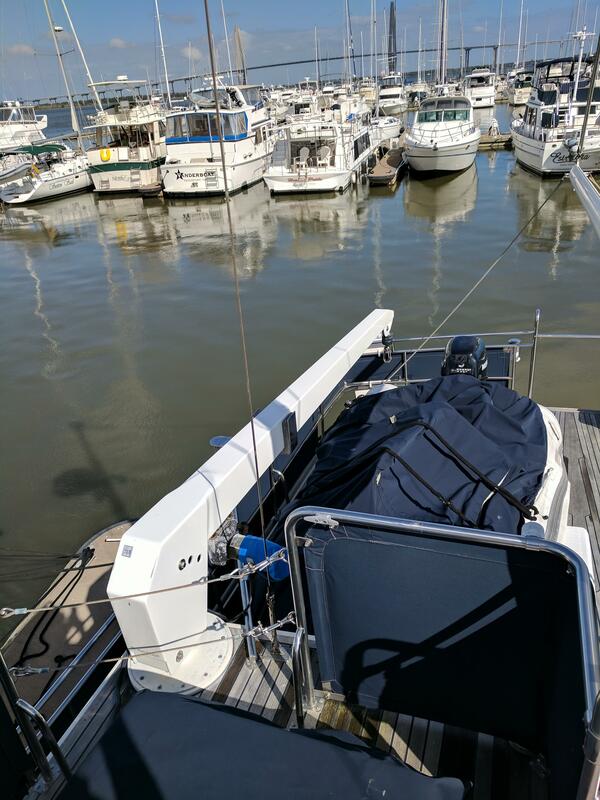 Shore power hook ups both forward and aft. Well laid out switch panels with all breakers clearly labeled. Engine room wiring is similarly clearly marked. Thoroughly equipped upper and lower helm stations. Built with single side band grounding (no SSB). 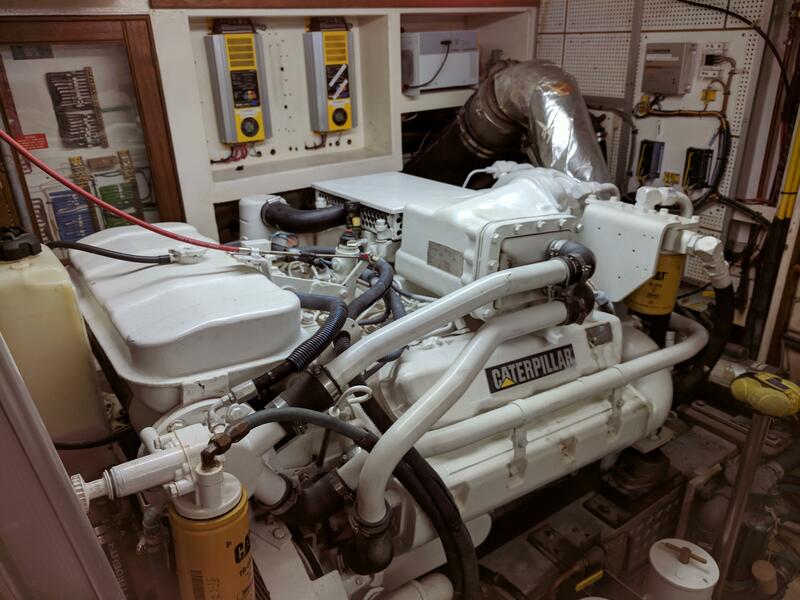 Walk in engine room showing the same careful maintenance that the rest of the yacht indicates. 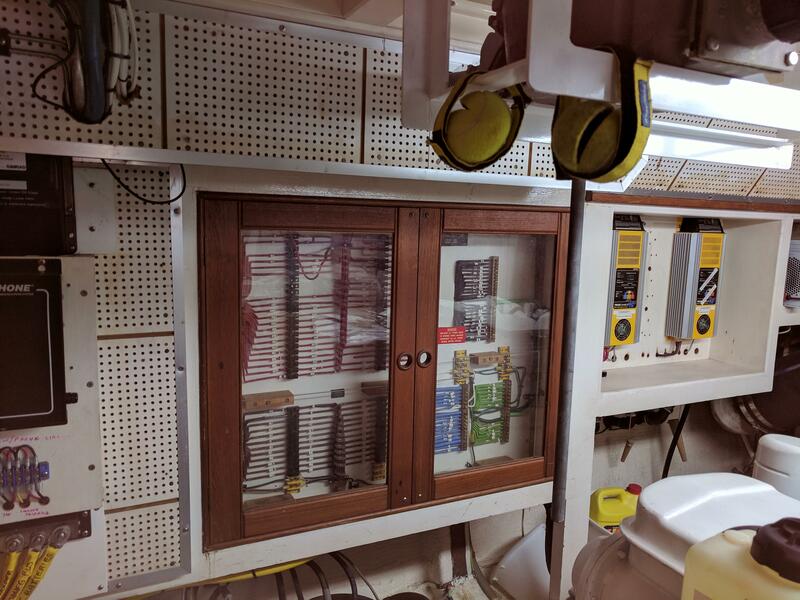 Full sized work bench aft. White hull with dark blue boot top. 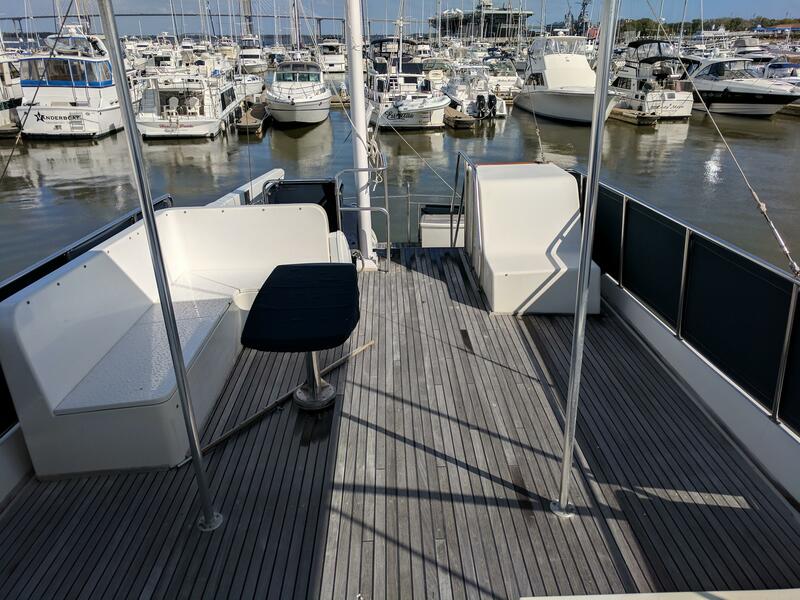 Wide side decks with thick Grand Banks teak overlay, this continues to the aft deck and flying bridge. All of the decks are in excellent condition. 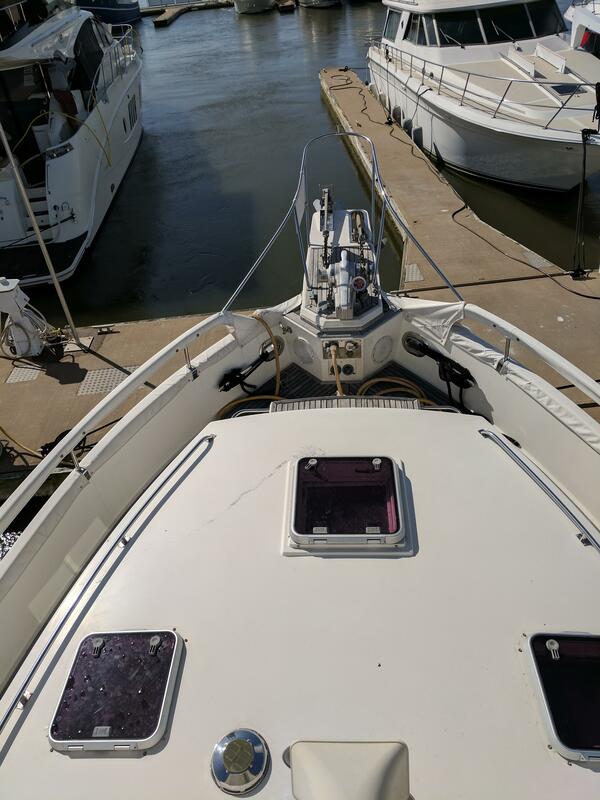 Up 3 steps from the side decks is the expansive aft deck with stowage boxes and dinghy stowage, then up 3 additional steps to the flying bridge. WAVE WALKER is a remarkable Grand Banks 49 in both her condition and equipment. She has been professionally maintained and cruised sparingly on the East Coast. 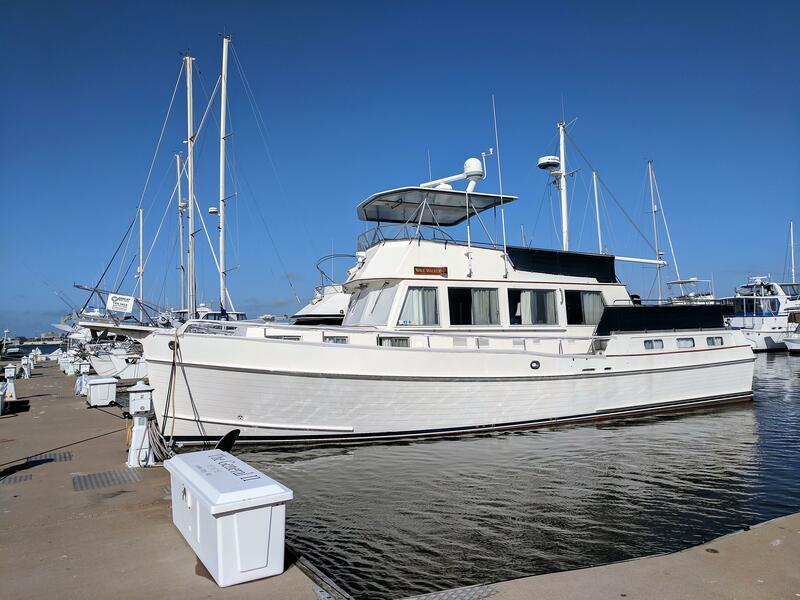 Her current owners have not been able to use her as much as they intended and are reluctantly putting her on the market for someone who can appreciate an outstanding vessel that is ready to go. She is aggressively priced and ready for offers.